Although Gungnir was released in Japan nearly a year ago, its North American release is still a couple months away. In the meantime, Atlus has released some of the first screens from the English version of the PSP exclusive. Gungnir is a tactical RPG developed by Sting Entertainment, and is the ninth episode of their Dept. Heaven series. The game stars 15-year-old boy Leonica and his magic spear, Gungnir. 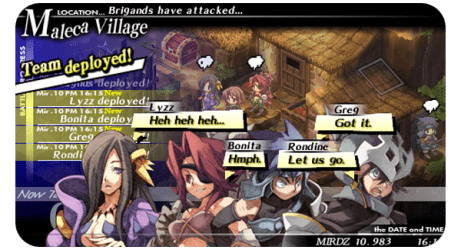 Because they were taken on the PSP’s smaller screen, the screenshots probably aren’t the best representation of how the game will really look, but you can check them out at the end of this post anyway. In addition to the released screenshots, Atlus also debuted the official English website for Gungnir here. This website will allow North American fans who have been eagerly awaiting the release of the game here to stay up to date with news and media. It also provides some details about the characters and storyline. For a visual look at Gungnir, browse through the screenshots below. The game is expected to be released on June 12, 2012.